Today, just over six months after passing 9,000 conventions and a year after the 8,000th convention was added, the 10,000th convention was added to the FanCons.com convention database. The database began in October 2003 as part of AnimeCons.com, but expanded beyond anime conventions with the creation of FanCons.com in early 2012. 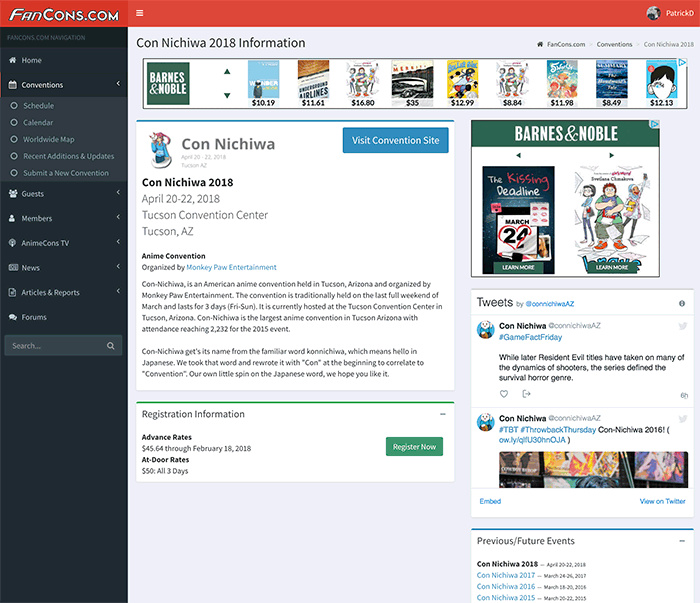 The 10,000th convention to be added was Con Nichiwa 2018 which is scheduled to take place in April 2018 in Tucson, Arizona. The first Con Nichiwa took place in 2010. The database of 10,000 conventions (which counts individual years of over 3600 different conventions) includes fan conventions around the world going as far back as 1936, there are still many, many more conventions out there. Any convention organizers who don't see their conventions listed can submit them. After the submission is reviewed for accuracy, the information will be added. The FanCons.com site also has a database of guests which recently passed 6,400 guests with the addition of actress Lindsay Jones who is known for her voice roles including Ruby in RWBY, Kimball in Red vs. Blue, and more. All of the data available through FanCons.com and its affiliated sites (AnimeCons.com, FurryCons.com, SteampunkCons.com, ToyCons.com, and VideoGameCons.com) has been painstakingly entered by hand by a team of unpaid volunteers with an appreciation and love for conventions. Behind the scenes, FanCons.com and AnimeCons.com are currently in the process of being re-written from the ground up. The new sites will not only present an updated UI with a mobile-responsive interface and improve the functionality of some existing features such as the user-submitted convention rating system. The new sites will also offer a number of new features which will be announced at a later date. The screenshot of Con Nichiwa accompanying this article was taken from the new site. Patrick Delahanty is the creator of FanCons.com and executive producer of AnimeCons TV. He has attended 170 fan conventions since attending his first in 1991.